Those people who know me as a theatre reviewer know that I have a list. This list includes some of my favourite theatre artists (directors, actors, designers), but they also include my list of “If I only had enough time to see their work” artists. Luckily, I had time to review not one but two artists on this list. The Haberdasher! 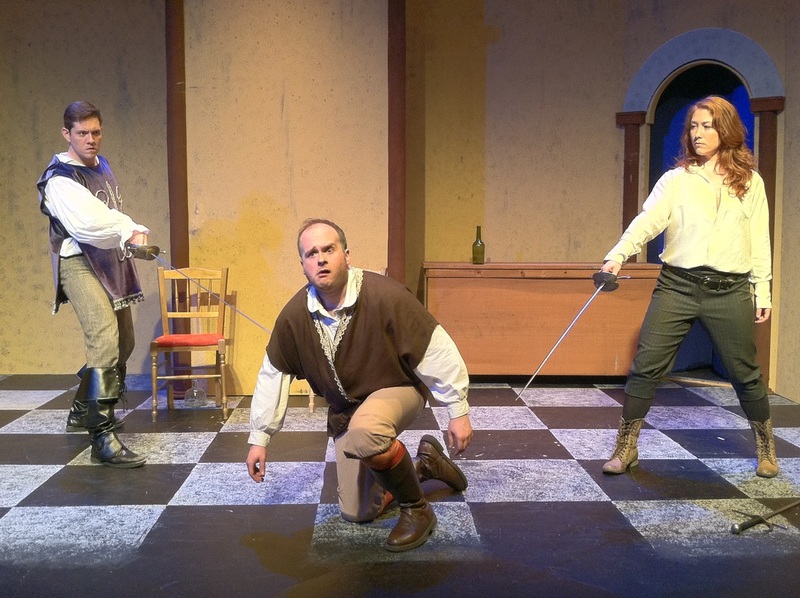 : A Tale of Derring-Do is an exciting new play by Boston’s always-clever, never-safe playwright Walt McGough. McGough is one of those playwright about whom you hear Boston theatre professionals whisper in hushed tones; he has quickly made a name for himself as a prolific playwright in the Boston theatre scene. Needless to say, I needed to see his work, and I was not disappointed. Equally exciting (and perhaps more aligned with my interests), I wanted to review a play directed by the My Theatre favourite Brett Marks. You see, when I stepped into the role as Head of the Boston Theatre Division for My Theatre, I had heard of Marks as a director with class, skill, and vision. In fact, my Managing Editor continues to rave about a certain production of Glengarry Glen Ross. So, when the cosmos aligned for an opportunity to see Marks direct McGough’s latest work, I knew that I had to find the time to attend. Again, I was not disappointed. McGough’s latest work is a swash-buckling, larger-than-life, grandiose tale of Antoinette (played with pluck by Kaitee Tredway), an orphan who is groomed to be a tailor, despite some aggressive mannerisms. Unfortunately, due to hilarious circumstances, Antoinette assaults customer after customer as our play opens, leading to her being fired. Of course, when a door closes, a window opens, and Antoinette is pushed out of her window by Vivian, a thief (played with remarkable versatility by Hannah Husband). Vivian has her own delicious back-story, hired by thugs to steal a locket from the Duke’s chamber, and she draws Antoinette into her forces, dubbing her “The Haberdasher!” and striking fear into enemies’ hearts with the blood-thirsty tales of Antoinette’s artful ways with a tailor’s measuring stick (nice touch, McGough). The opening scenes are exciting with a small taste of the swash-buckling sword-and-word play that is to come. Marks excels in keeping his characters grounded in their exciting stories while allowing McGough’s one-liners to zing, especially with the lofty caricatures. One of McGough’s more clever decisions was to write the play for four actors, each of whom must don a number of roles to fill out the village. This decision plays out to hilarious and side-splitting effect later in the play, and provided a nice opportunity for these actors to flex their acting muscles by creating these multiple roles. Marks does an excellent job coaching his actors to find the numerous characters’ distinguishing physicalities and voices. The strongest performances come from Husband and Brendan Mulhern, who have some truly wonderful moments as love interests. Mulhern impresses with his natural presence, easy comedic timing, and broad physical comedy (including his dim-witted thug Bruno, slightly-deranged castle dweller, and the loveable constable). Mulhern switches between the many voices and physicalities with such ease that you feel that he could have played the whole show by himself. Luckily, he has Husband who matches him with her ferocity and sexiness. She explores her voice’s full range to play Vivian, the sadistic henchman Robert, and a host of other characters. She is dynamic and wonderful to watch. Her poise and presence onstage are remarkable, as she commands each moment with a flick of the wrist and the raise of an eyebrow. Mark Estano brings some wonderful moments to his characters, most of them emerging with solidarity in the play’s second act. I didn’t care for his drunken Frenchman and the haberdasher Bellamy, feeling that he wanted to play the “funny” man instead of the “straight” man that his characters seemed to be written to play. However, once he dons the dress, as it were, he comes alive as the Duke’s hysterical wife, showing that he has more than enough acting and comedic chops to carry the scene. Tredway gave me pause. While I had heard about the production’s unfortunate, last-minute replacement, I didn’t know what to expect for this giant role. Tredway plays the least number of characters because her Antoinette dominates the show as the “leading lady.” However, her Antoinette was just not interesting enough to hold my attention. She seemed to still be remembering her lines (very understandable) and coming to terms with McGough’s hilariously funny script (less understandable). She breaks character every so often to almost laugh at the play’s ridiculousness with the audience, barely stifling a giggle (cute, but misplaced). I saw the opening night’s performance so perhaps more practice alleviated this acting quirk. Regardless, Tredway delivers a commendable performance given her short rehearsal time and giant boots to fill. Marks proves himself an incredibly agile and accomplished director with McGough’s challenging piece. Marks does not back down from a challenge, staging fights with the help of genius Angie Jepson, and orchestrating costume changes and exits that will make your head spin faster than Estano’s wig as the Duke’s wife. Jepson flexes her creativity as the Fight Director by developing remarkable fights. While simple, they are cleverly simple, allowing the actors not to lose their character and even adding flourishes to their character with each duck and blow. Jepson allows her fight choreography to feed into telling the story, rather than as an artful distraction. Erica Desautels’ costumes are brilliantly versatile, a beautiful tapestry of colors and fabrics to tell the diverse story of characters. Desautels allows class and character to shine through her dresses and capes, wigs and cloaks, showing that she is the real magical Haberdasher behind this production. While Luke J. Sutherland’s set design failed to impress me at first, I learned early in Act II how subtly clever he designed the set to function in the play’s more chaotic moments. With its simplicity, Marks is able to orchestrate a stunning and whirlwind ending that will have you questioning whether you just watched actor mayhem or artistic genius. I need to “critique” McGough for his work. While he crafts a fine piece of action-adventure for the stage that reminds me of The Princess Bride and the like, I felt like there was something missing. He has all of the pieces assembled for a commentary on gender, expectations, and fulfilling one’s destiny, but no themes really shined for me. In fact, they took a backseat to some of the always-interesting, but rarely poignant, storytelling. In a phrase, it was a delightful night at the theatre, but nothing more for me. However, I couldn’t help but smile as I left the theatre. And listening to the audience buzz with excitement after the stunning performances, I had to acknowledge the powerful art of storytelling for the stage. Maybe the theatre didn’t need any lofty themes or questions for the audience to consider. Maybe McGough just wanted to delight under Marks’ masterful direction to tell a story of four actors who could create a village before the audiences’ eyes. Maybe all we needed was to escape back to a time of destiny and trickery, sword-play and witticisms, love interests and haberdashery. And maybe that’s just what I needed.